Were it not for the fact that both of these men became celebrities on April 26, 1865, these photographs would not have existed. It was Boston Corbin who shot John Wilkes Booth and Edward P. Doherty, who led the detachment that cornered Booth. Both appear as they might in the field, an officer and enlisted man from Company L of the 16th New York Cavalry. Notice that the floor and baseboard is the same in the two photographs. The difference, however, was that Corbett's temptation had to do with another part of his body that is prized by most men and his effort at performing surgery landed him in Massachusetts General Hospital. Corbett was living in New York in 1861 and initially enlisted in the 12th New York Infantry, a 3-month regiment. On August 4, 1863 he joined Company L of the 16th New York Cavalry. Corbett's record as a soldier was just as erratic. As long as he kept himself checked, he functioned rather well and on more than one occasion was promoted. On other occasions he was disciplined or busted in rank for getting out of line. On June 26, 1864 at Centreville, Virginia he coolly stood his ground and emptied his weapons as John S. Mosby's Partisan Rangers overran his command. His insane bravery may have saved his life as the Confederates were so impressed by his manly if insane performance in the face of overwhelming numbers that they did not shoot him down. He was captured, housed at Andersonville and later exchanged and returned to duty. Corbett was mustered out August 17, 1865. The remainder of his life was a rather sad descent into madness and he finally just disappeared. His date of date is uncertain. Edward Paul Doherty was born in Canada in 1840 and also immigrated to the United States. On April 20, 1861 he was as a lieutenant in Company A, 71st New York National Guard Regiment for 90 days service. He was captured at Bull Run and escaped. Next, he became captain of Company A of the 155th New York Infantry of the Corcoran Legion, but resigned on May 18, 1863. On September 5, 1863 he was commissioned as first lieutenant in Company L of the 16th New York Cavalry. He was mustered out on September 21, 1865, but after the war served in the Regular Army 1866-1871. He died in New York City on April 3, 1897. Boston Corbett is wearing a "McDowell cap." On the first image it appears he had a small pair of crossed sabers on the very front of the crown. In the second image he has a similar cap with a government issue pair of crossed sabers and the initial of his company on the crown. Corbett's coat is a well worn, 4-button sack coat with his sergeant's chevrons on the sleeves. On the first image it appears that he might be wearing some type of badge on the left breast but the second one does not show it. In the second image one can see that he has what must be a pocket testament in the pocket of his sack coat. His trousers have a regulation yellow stripe of a sergeant. In the first image he is wearing high topped riding boots of a type that would be private purchased. In the second images he is wearing regular issue Jefferson half-boots with the pants cuffs over the boot. The first image shows him wearing his accouterments. Visible are a holster, cap box, saber and the cross belt of his sword belt. Edward P. Doherty is wearing a private purchase hat with an officer's hat cord, but no visible insignia. His jacket is a non-regulation officer's short jacket, which appears very commonly in period images and was popular in the field. On the shoulders are his shoulder straps, indicating that he was a newly promoted captain of cavalry. 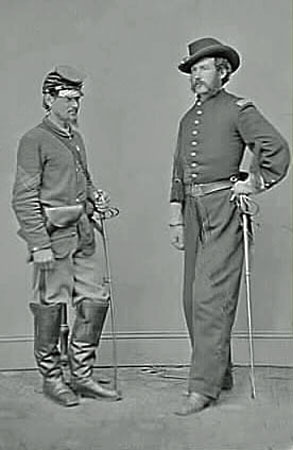 At the time of Booth's death he was still a lieutenant. On his hands he is wearing riding gauntlets, the cuffs of which are turned down. Hardly showing is the thin yellow cord running down his trousers. He wears a sword belt and buckle, but no cross belt. At his side is his saber.